Canada's exports were down 1.2% in October, principally on lower exports of crude oil. Imports were down 0.6%, mainly due to fewer imports of passenger cars and light trucks. 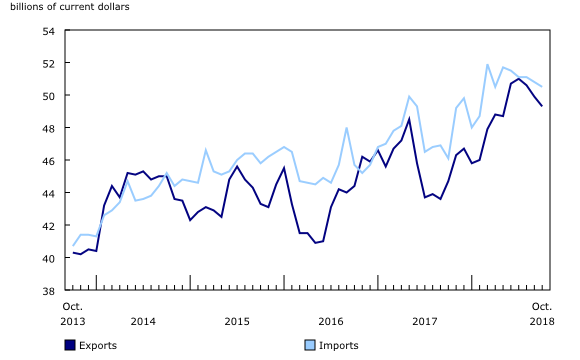 As a result, Canada's merchandise trade deficit with the world widened from $891 million in September to $1.2 billion in October. In real (or in volume) terms, exports showed an opposite movement (+1.2%) compared with nominal export values in October, as lower energy product prices led to a 2.3% decrease in total export prices. Meanwhile, real imports were essentially unchanged in October. On a nominal basis, total exports fell 1.2% in October, despite increases in 7 of 11 sections. A decline in exports of energy products was partially offset by higher exports of motor vehicles and parts, and farm, fishing and intermediate food products. Exports excluding energy products were up 1.6%. Exports of energy products fell 12.4% to $8.8 billion in October. Exports of crude oil (-16.2%) drove the decrease, offsetting most of the earlier gains in 2018. Crude oil export prices were down 15.4%, the strongest monthly decrease since February 2016. The drop in October coincided with deepening price discounts for Canadian produced crude oil. Crude oil export volumes declined 0.9%. Partially offsetting the overall decrease were higher exports of motor vehicles and parts, up 4.4% to $7.8 billion. Passenger cars and light trucks (+6.6%) contributed the most to the increase in October. This reflected a drawdown of motor vehicle inventories that had increased in recent months. Year to date, the cumulative value of exports of passenger cars and light trucks was down 7.6% compared with the same period last year. Exports of farm, fishing and intermediate food products also partially offset the decrease in October, up 4.8% to $3.4 billion. Higher exports of canola were behind the increase. The canola harvest season was delayed this year due to unfavourable weather conditions during the summer, leading to atypically low levels of exports throughout the third quarter. In spite of the October increase, the year-to-date cumulative value of exports of canola was 12.7% lower compared with the same period last year. Total imports fell 0.6% to $50.5 billion in October, the fourth decrease in the past five months. Declines were observed in 7 of 11 sections, led by motor vehicles and parts, and basic and industrial chemical, plastic and rubber products. Partially offsetting these decreases were higher imports of aircraft and other transportation equipment and parts. Year over year, total imports increased 9.6%. Imports of motor vehicles and parts declined 3.5% to $9.1 billion in October. There were lower imports of passenger cars and light trucks, down 5.8% to $3.9 billion, the first time import levels have fallen below $4 billion since December 2016. This was the sixth decrease in the past seven months for imports of passenger cars and light trucks, reflecting lower auto sales in Canada in recent months. Moreover, imports of electric cars fell sharply in October after peaking in September, coinciding with the end of the rebate program in Ontario for these vehicles. Imports of basic and industrial chemical, plastic and rubber products also contributed to the decrease in October, down 4.5% to $4.0 billion. Lubricants and other petroleum refinery products (-13.6%) contributed the most to the decline, mainly on lower imports of crude oil diluents from the United States. Partially offsetting the overall decrease in October were higher imports of aircraft and other transportation equipment and parts, up 11.3% to $1.7 billion. After reaching its lowest level in more than five years in the third quarter of 2018, imports of aircraft rose in October, mainly on higher imports of airliners from the United States. Imports from countries other than the United States fell 4.1% to $17.1 billion in October. Contributing to the decrease were lower imports from China (various products), Japan (passenger cars and light trucks), the United Kingdom (motor gasoline) and Saudi Arabia (crude oil). Exports to countries other than the United States were up 2.3% to $12.9 billion. Higher exports to Hong Kong (gold) and Japan (canola) were partially offset by lower exports to the United Kingdom (gold). 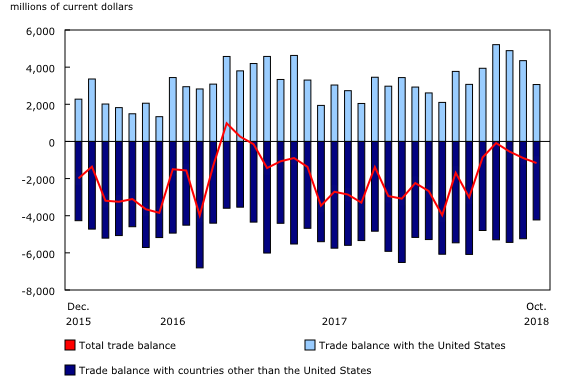 As a result, Canada's trade deficit with countries other than the United States narrowed from $5.2 billion in September to $4.2 billion in October, the smallest deficit since December 2016. Exports to the United States fell 2.3% to $36.5 billion, mainly on lower exports of crude oil. Imports were up 1.3% to $33.4 billion. As a result, Canada's trade surplus with the United States narrowed from $4.3 billion in September to $3.1 billion in October, the smallest surplus since March 2018. Revisions reflect initial estimates being updated with or replaced by administrative and survey data as they become available, as well as amendments made for late documentation of high-value transactions. Exports in September, originally reported as $50.4 billion in last month's release, were revised to $49.9 billion, mainly on revised exports of crude oil. September imports, originally reported as $50.8 billion in last month's release, were essentially unchanged in the current month's release. With this release, Statistics Canada is publishing international merchandise trade data classified according to the North American Product Classification System (NAPCS) 2017 version 1.0. Previously, NAPCS 2007 was used to classify merchandise trade by product. In addition, price and volume measures previously calculated using 2007 as the base year have been recalculated using a new selection of representative goods, with 2012 as the base year. New price information and changes in basket weights have also been introduced. Monthly NAPCS 2017 values are now available from 1988 to present. Previously published values at the total export and total import levels have been preserved, but changes will be apparent at all other levels of the NAPCS 2017 classification. Base year 2012 prices and volumes classified according to NAPCS 2017 are available from 1997 to present. Compared with previously published data, prices and volumes will be different for all levels of detail, including total exports and total imports. For more information, please see NAPCS 2017 and Variant of NAPCS Canada 2017 Version 1.0 - Merchandise import and export accounts. For more information on these and other macroeconomic concepts, see the Methodological Guide: Canadian System of Macroeconomic Accounts (Catalogue number13-607-X) and the User Guide: Canadian System of Macroeconomic Accounts (Catalogue number13-606-G). On December 19, Statistics Canada is planning to release experimental statistics for monthly trade in services covering the reference period January 2007 to October 2018. Real-time table 12-10-0120-01 will be updated on December 17. This table replaces table 12-10-0089-01 which will be archived. Data on Canadian international merchandise trade for November 2018 will be released on January 8, 2019.